You're working hard these days. eBay just won't cut you a break. Shouldn't you know Mr Reacher? He commented 2 minutes before you. look in the t&c's - just behind Wally…. Holy crap, j4ck & reacher were the first two posts. Can you imagine the withdrawal symptoms us ozbargainers will have when they finally stop these 20% off sales? You mean, when we will be given genuine bargains, below RRP prices and not highly inflated prices for these sales? I can only imagine. With a brand new invention? Something grabs a hold of me tightly..
@Qbagger: Yo i don't know! @luketechfast: Doing god's work son. Appliance Central have removed their OLED B8 65" ad, which was at $3,150. Let's see what they do here…. 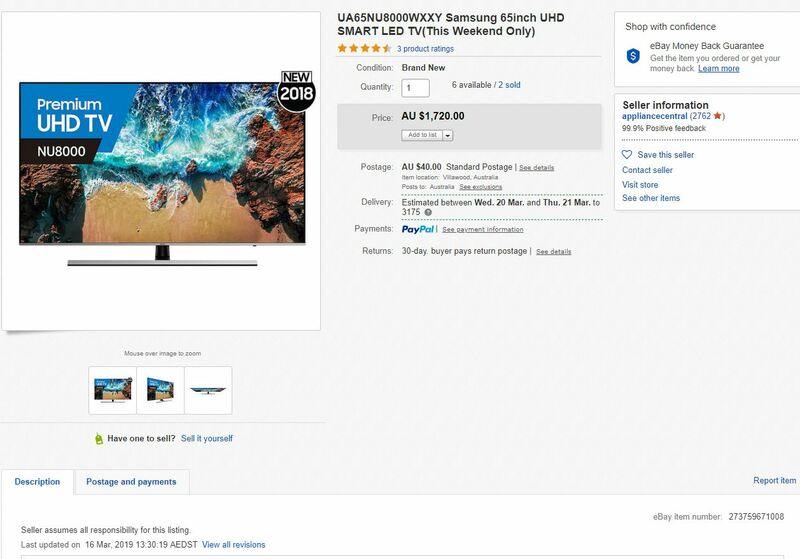 Yep and also removed the Samsung NU8000 series - NU8000 65" was $1720 and $3290 for the 75"
Please link these products and let me know the before and jacked price. Happy to raise a complaint with eBay…i've raised so many complaints over price jacking. I wanted to buy a apple watch from Gadgetsonline just a day ago it was $1,279 now they have jacked up the price to $1,579 . Its bloody ridiculous. Cant trust these bunch anymore. I got the 75 NU8000 in my watch list n this sh1t happens?!?!?! It is back. I just bought the OLED65B8STB for $2860 + $40 delivery. Also bought the Samsung HW N950 soundbar for $1080 + $24.70 delivery. Well that explains why a bunch of the laptops I've been checking on ebay all jumped in price by $300 today..
Hard to find any cheaper than $500 unless happy to wait for Black Friday deal? They price jacked last time round so you're not missing out. Really? Even 2060s? I hope it was a one off and not a continuing trend! I believe so. They said the suppliers increased their prices. Polk Audio Omni A1….does almost everything this does…unless you are already invested in Yamaha MusicCast system. The Polk would be suitable for people with Onkyo/Pioneer receiver as it uses DTS PlayFi system. … and there it goes! Listed price has already been raised by $60!!!!!! Nothing to see here. Couple of deals I've spotted today that aren't bad… will depend what happens tomorrow! Being Askhole on 18/03/2019 - 15:53 Comment score below threshold (-4). bzha515 on 18/03/2019 - 15:54 Comment score below threshold (-4). Would you buy a phone from any one listed here? I’ve bought from them. I’m happy and have had the phone over 1 year now with no issues. Came in a plain white box without a charger plug or lightning to headphone adapter. But it was a darn good price at the time for a iPhone 7 second hand. Excellent. My tv died last week so good timing. Hoping the LG B8 gets posted before the sale. I am currently leaning towards the Samsung, but hoping some people that have owned any of these can give me some appreciated advice. I had a look at all of them at lunch break.. the 75p7 looked the best then the sammy. But the hisense was really thick. I'd steer clear of the Hisense 75P7 - far too many issues in the TV according to Whirlpool. Besides - expect no updates for Dolby Vision or Atmos. Care to link as thats not really what i have observed. too many to list, you are better off reading this thread: https://forums.whirlpool.net.au/archive/2719563 to draw your own conclusions. The reliability is the major issue. Also remember no firmware updates for the 2018 models, so no support for dolby vision or atmos and a poor implementation of HDR. Can someone explain this, am i missing something or is one the price jacked version? Mate 20 Pro. Same product, Same Seller, Same Description, 2 different prices?? I am Jack's cold increase. Oh man, I was only thinking over the weekend that I need to watch that again. One of my all-time favourites! Right, that does it… I'm watching it tonight!! @thisisscotts: Ha. You are not a beautiful and unique snowflake. How's that working out for you…. being clever? @SteveAndBelle: Mate, you should see my apartment. It's my life. @thisisscotts: You are not your job, you're not how much money you have in the bank. @thisisscotts: Oh yes… and if you vocalise the dialog while doing it everyone thinks you're weird. They don't know what they're missing!! @thisisscotts: Can't believe I forgot this one: "His name is Robert Poulson… His name is Robert Poulson… His name is Robert Poulson"
This list only serves me as a "shops to avoid". Have you purchased from any of these sales where the RRP is stupid high, and then claimed against the price somewhere else? I understand that they take the amount paid for on the card and then apply the % paid on card vs total and adjust and refunds based on that too, but surely there is some extra savings to be had or is my logic wrong here? S10+ 128GB: 1,899-300 = $1,599 on card. So 84%. Actual RRP and what you can get it for elsewhere is $1,499. Price difference base = 1899-1499 = 400. 400*84% = 336 refunded via insurance. $1,599 - 336 = $1,263 paid for the phone. Any Apple Airpods with prices not jacked up? For anyone after audio gear I don't think I've seen addicted to audio's prices change. The iFi xdsd I've had my eye on has been the same price on eBay as it is on their website. They've always been good afaik, in terms of prices and service. Will Sony WH1000x3s be Cheaper? Any of these stores sell Weber barbecues at all? Jack is back, Price Jack that is. What a joke. Seller pulls several listings before the sale.